Got all my taps built , ready to go. Thought I had everything ready to go. Bought the blocks etc. But now look and the diagram I have is for using 2 taps,I have 12 .Six for each of 2 lanes,its a 4 lane set up. Thought I wired example with 2 power supplies 6 wires to a block and coming from power .But these block you can't do that . Does anyone have a picture or know a site that has one. Was all ready to go and now at a stand still . Just want to do it right . Have 12 peices of track tapped , using 6 in each section of track ,its a 4 lane.So 6 and 6 . Wiring the taps should be no different than the main supply to the track, they're really just an extension of your main hook-up. This diagram is for a positive polarity track. All you need is a positive (black wire from controller) and the negitive back to the power supply, two wires per lane at each tap location. Last edited by ruralradio; 09-26-2011, 02:58 PM. Reason: 'cause I'm getting cornfused, too!! This diagram shows 2 taps, just hook up all your taps to the same terminal screws as the 2 taps shown. For some reason I can't open file. Hey, that's fancy, with the brake switch and polarity switch to change running direction! jlsweda, maybe you don't have excel on your computer. I'll try to get it into another format. So how do you put 6 power taps too this . Do they sell a block that I can connect all the say positive to and one for negative and go from there. All your taps can be wired to the same distribution block, lane by lane. The electricity won't know the difference. 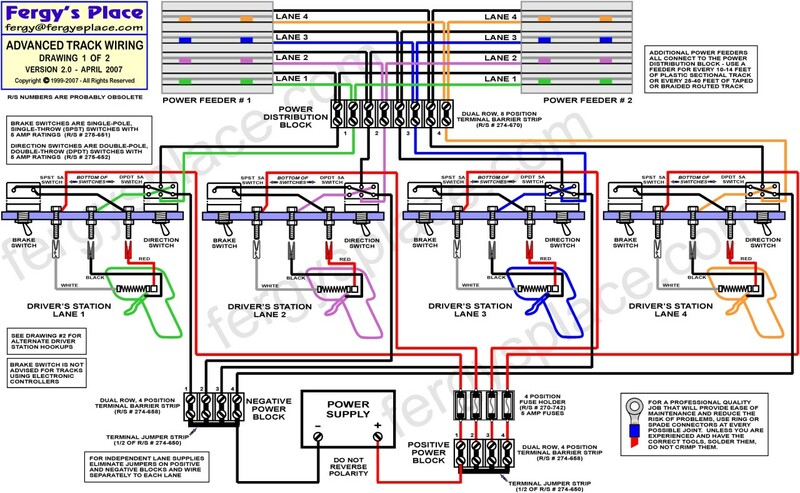 The diagram I posted does not show each individual power tap. Last edited by ruralradio; 09-26-2011, 04:33 PM. Run six wires each from the supply off the Pos Neg. You made need to find an adapter that will fit six wires on the supply. If you run one wire to a six wire block, the likleyhood of getting surges when a car comes off will be there. Have 2 good power supplies , one for each side . 2lans/2 lanes . So that would work , I can crimp them on a ring tab . That way , same all the way through . I thought you were asking about 6 lanes. I would think you just need four lines from the supply and longer screws or bigger blocks that allow for more wires in your conection. This scematic is pretty trick. Being able to go both ways. Is that what your doing? I see why you wouldn't want electronic controllers hooked up to this type of set up. Blown fuse or full on at the flip of switch . If your going the sienic route, this is cool. Fancy yes. Not really needed if one was looking to wire a track with a brake circut going one way. If you need buss bars, check these out. These are what I used on my track. Exactly what I was looking for ,but didn't no if I could use them , Home Depole or Radio Shack?